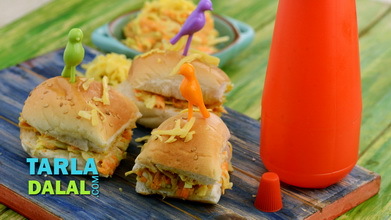 Vegetable sandwich, common fare on the Mumbai streets, this is a wholesome meal that you can feast on however short of time you are! Each sandwich is neatly cut into six equal pieces and served with tomato ketchup and chutney. And not to worry if you like it piping hot… bhaiyya will be very happy to toast them for you. Heat a broad non-stick pan, add the cumin seeds, cloves, cinnamon, black peppercorns, fennel seeds and star anise and dry roast on a slow flame for 2 to 3 minutes. Keep aside to cool. 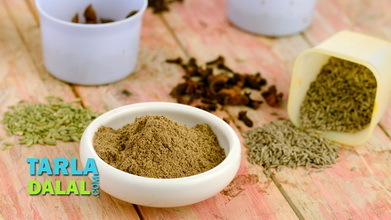 Add the black salt, rock salt and dried mango powder and blend in a mixer till smooth. Trim off the edges of each bread slice and apply some butter and ½ tsp of chutney on it and keep aside. Place a slice of bread, with the buttered-chutney side facing upwards, on a clean and dry surface. 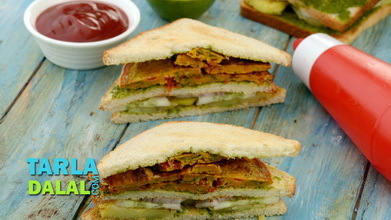 Arrange 5 cucumber slices, 4 potato slices and sprinkle some sandwich masala evenly over it. 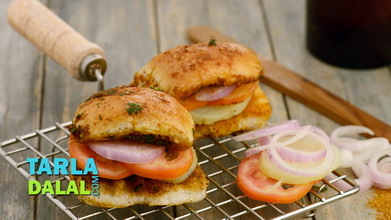 Arrange 4 tomato slices, 3 beetroot slices, 2 onion slices and again sprinkle some sandwich masala evenly over it. Cover it with another slice of bread, with the buttered-chutney side facing downwards and press it lightly. Cut into 6 equal pieces, place it on a plate and apply some butter evenly over it. Repeat steps 2 to 6 to make 3 more sandwiches. 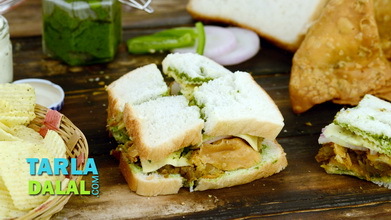 Serve the vegetable sandwich immediately with tomato ketchup and green chutney. 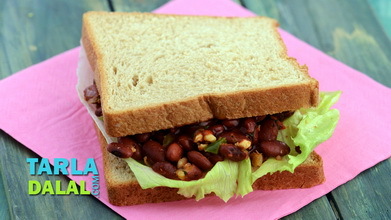 Brown bread vegetable sandwich: replace white bread with brown bread for a healthier version of this delicacy. 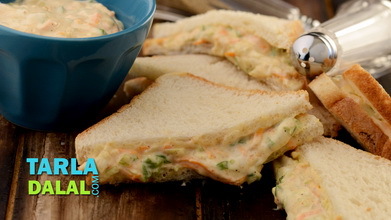 Cheese vegetable sandwich: simply put a generous amount of grated cheese over the tomatoes (after step 4 in the above recipe), top with another slice of bread and some more grated cheese over it. Cut into 6 equal pieces and serve immediately. 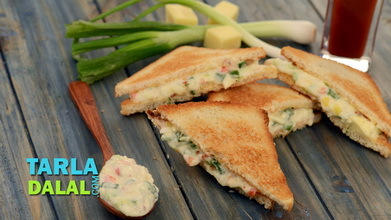 Veg toast sandwich: place the sandwich in an electric toaster or a hand toaster and cook using butter till it turns brown and crisp on both sides. Remove and cut into 6 equal pieces and serve hot topped with butter and nylon sev. 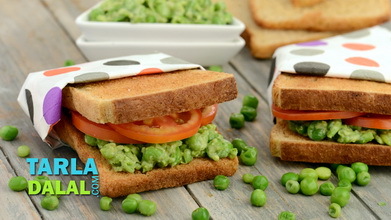 Jain vegetable sandwich: to make a jain version, use generous amounts of cucumber and tomatoes in the above recipe. Do not add onions, potatoes and beetroot. You can have this sandwich as it is or toasted.